St. Benedict’s is committed to the teachings of the One, Holy, Catholic, and Apostolic Church. We serve the Triune God: The Father, Son, and Holy Spirit – our salvation is found in Him alone. We accept fully the faith once delivered in the Sacred Scriptures as containing all things necessary unto salvation, the three ancient Creeds (Apostles, Nicene, and Athanasian) as the right interpretation of the Sacred Scriptures, the Seven Ecumenical Councils, the teachings of the Ancient Fathers, and the British Divines. In accordance with Scripture, St. Benedict’s faithfully celebrates the Holy Sacraments, participating in the grace which God pours upon His church through them. We recognize Holy Baptism and the Holy Eucharist as ordained by Christ (Dominical) and necessary for salvation. Likewise, the ‘Lesser Sacraments’ (Confirmation, Reconciliation, Marriage, Holy Orders, and Unction) are ministries of the Holy Spirit given to for the benefit of the Church and our faithful use. Thus, we affirm the seven Holy Sacraments. Our historic and liturgical worship, is ordered by the traditional 1928 Book of Common Prayer and enriched by the 1940 Hymnal. 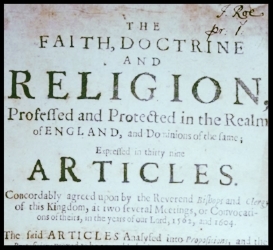 We vigorously hold to the plain understanding of the 39 Articles of Religion of the English Reformation as the doctrinal standard of our faith and practice.